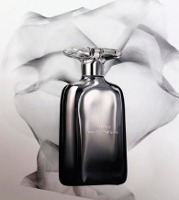 "This one has been selling like crazy," the dark blonde woman in the suit told me as she hoisted the gorgeous, silvery bottle of Narciso Rodriguez Essence Intense. "At the fragrance festival last week we sold six bottles in two hours at $110 a pop. It's been doing so well that I wouldn't be surprised if they add it to the regular line-up." I was at Nordstrom trolling the perfume area for something new to smell, and by chance I happened on the Beauté Prestige rep who handles Narciso Rodriguez as well as Annick Goutal, Hermès, and a few others. She sprayed a generous slick of Essence Intense on the back of my hand (my forearm was already occupied by Chanel Bois des Iles) and awaited my reaction. While the fragrance settled, I admired the fragrance's heavy, wavy bottle, this one with a darkened stripe toward its bottom to set it apart from the regular Narciso Rodriguez Essence. I lifted my hand to my nose. Aldehydes, orange flower, rose, metallic soap. "It kind of smells like the original, doesn't it?" "This one is less flowery," she said. "More warm. Plus, the original has white musk. This one has 'modern musk.'" She made me a sample of Essence Intense and a new sample of the original Essence and generously threw in a sample of the Essence body cream, too, so I could layer them. Side by side, Essence Intense and Essence are definitely related but not the same scent. Still, I think Essence Intense is a little ambitiously named. "Essence Slightly Warmed" might be a better, if not really marketable name. Maybe "Evening Essence" would work. The original Essence smells to me like linen ironed with rose, iris, and orange-flowered tinted steam. It is diffusive, soapy, slightly metallic, and stings the nose with aldehydes. Essence Intense is the same festival of clean, tingly aldehydes, but with a whisper of amber and a touch more benzoin. It really is warmer than Essence, but it maintains the original's feel of clean, soapy skin. As it dries, Essence Intense shows less orange flower and more clean musk than the original. Still, Essence Intense can't by any definition be called "earthy." It is still a tight, clean fragrance. Just a little bit less metallic than the original and a little warmer. Essence and Essence Intense both stay very close to the skin and have similar persistence — about four hours on me, and I can only smell it if I press my nose to my skin. The Essence body cream, made by Shiseido, is marvelous. Applied after my evening bath, it lasts through the night and day to be washed off at the next night's bath, but it never feels heavy or greasy. Its fragrance is subtle. As far as I can tell, though, it doesn't do a thing for the Eau de Parfum. So many people these days say they don't like perfume. They like the smell of freshly washed skin. If I were Santa, I'd put a bottle of Essence Intense under the trees of every one of those people who favors velvet. I'd put a bottle of Essence, the original, under the silk wearer's trees. The Essences were made for them. The thing is, I do like perfume. When I want to smell of clean skin, I'll go with the salty, fresh iris-suede of Parfums DelRae Mythique. As I waited for the rep to fetch my samples, I talked to the sales associate, the glamorously named Bruce Terrible. In front of us were testers of the Chanel Les Exclusifs. "Do you have the 100 ml size yet?" I asked. "No, but we can order them," Mr. Terrible said. "I think they're $110." Hmm. The same price as the 100 ml Essence Intense Eau de Parfum. I sniffed the Bois des Iles on my wrist. No contest. Narciso Rodriguez Essence Intense Eau de Parfum comes in 50 and 100 ml. I have nothing really to say about Essence Intense (they don’t carry it at my Macys I believe) but I do agree with your sentiment about Mythique! It is a surprise favorite of mine, as I generally dislike iris, but the buttery smell is so wonderful. Mythique sort of surprised me, too–it snuck up on me. For me, it’s a great, daily scent and really easy to wear. Isn’t that the most fabulous name? I couldn’t resist mentioning it. The Essences are probably terrific for people who don’t really like perfume. For the most part, they smell like a good scrubbing with Camay, plus a little “perfuminess” in the nose. But I’m with you–hand over the Bois des Iles. Ditto on the Bruce Terrible, that’s too good! While the scent didn’t wow me (boring after a few wearings)-musk and metallic scents do work well on my skin. Anything odd, for that matter does….. I had a bottle of the first Essence, wore it for two weeks and traded it for a bottle of Hermes EdM, edt…. Have you tried La Myrrhe? I wonder if you’d like that one, given its super-dose of nearly metallic aldehydes. No but I should. I tried several SL’s yesterday, Arabe, Chergui among them, (it was still on skin this morning)….. I don’t think I’ve ever tried that one. I should really try no more than three at a time and let them develop….. I do that all the time–overload my skin and nose, that is. It’s so tempting, though, when you have the chance to try a good selection of fragrances. Oh, La Myrrhe… it’s so shimmery. And icy-rosy. It really is beautiful. Grr… As I was saying FLOWERS and roses at that. None of the others have floated my boat either. Ah well, more money to go toward Rubj EDP! I want a bottle of Rubj EdP, too! It’s worlds away from Essence, that’s for sure–it’s more for the person who actually wants to smell a little dirty. I love the bottle, too, and it feels so good to hold. The fragrance really is perfect for what it is, it’s just that what it is doesn’t move me in particular. I was supposed to receive a sample of NR last year via mail( I was on my search through the net for free samples) and what a suprise that I waited for 4 months and didn’t receive it. From what you say Angeal, it sounds like I didn’t miss much. I’m sorry you didn’t get the sample! I’m guessing, though, that it might not have totally wowed you if you’re looking for a fragrance with presence. But if you want to smell squeaky clean, you should definitely try it. Come to think of it, I like a more “deeper” fragrance. Thanks for the tip! Sorry about the typo Angela! I make typos all the time–no apology necessary! I didn’t get the whole scoop on Les Exclusifs small bottles, but here’s what Bruce T told me: “Store One”, the original Nordstrom in downtown Seattle, has the 100 ml bottles. (I didn’t ask him which of Les Exclusifs they were, since it never occurred to me they might not have them all.) He said they were a limited edition. I write this with a disclaimer, though, that this is my potentially faulty remembering of what he said. Now THAT’s exciting, Angela! 100 ml Les Exclusifs!! And you got samples out of Nordstrom! I’ve tried in Tampa and DC and gotten the stink eye. Nice work all the way around. Thank goodness there’s enough turnover in fragrance staff that they don’t don’t get tired of seeing me ask for samples! The fragrance area in my Nordstrom seems to have changed over the years, too. For instance, they used to carry Caron. Hopefully that link comes through. Oops, hit “post” too soon. Meant to say if you scroll down you can look at each bottle and see which one comes in the 2.5 for $110, and which are still the whopping 200 ml bottles. Thanks, Kitty! Hubby gave me the honkin’ bottle of 31 RC last Christmas, and I might have to put it in my will it’s so big!!! Thanks for the link! I’ll check it out. A few of them are really tempting. Coromandel, for instance, if it’s in the smaller bottle. And Bois des Iles and Cuir de Russie. Dang, it looks like Bois des Iles isn’t in the mix for the 2.5-ouncers. But Sycomore and Coromandel are…. Sadly to say Bois des Iles (my very favorite, closely followed by Cuir de Russie. 31 Cambon and La Pausa) are not among them at the present time. It sounds like we share some of the same favorites. Oh well! Thank goodness for decants. Thanks for the review, Angela. What a beautiful bottle! I love the bottle, too. The style of it really does suit its contents, too–modern, clean, vaguely metallic. I’ve never been a fan of subtlety when it comes to fragrance, so the love for skin scents evades me. That being said, I know many many people adore them and it’s great for them to have a good quality alternative. And it sounds like that’s exactly what the Essence frags are. Mr. Bruce Terrible definitely needs to be someone’s boss. Imagine the fun of saying…”my boss is Terrible” and having it not be a pejorative expression. His name truly is film-worthy. I bet he’s heard every joke in the book, too. Darn skippy ! No contest indeed. Totally interested in this. I wish I could get a 100 ml of Cuir de Russie or 28 LP. But of course the ones I adore are not available. The big bottles are just so huge! I wouldn’t even mind seeing 30-ml bottles of Les Exclusifs. 30 ml bottles would be great if they came in an eau de parfum, but most of the Exclusifs are much more fleeting and one must spritz quite a lot. I’ve noticed that, too. Except for Coromandel. Ahah I meant to say totally NOT interested. Oops. I think Essence is a nice fragrance, really, and I’m not surprised that it’s so popular. well, with my tastes in perfume (and Santa knows me well) there’s very little risk of me finding a bottle of Essence under my tree on Christmas. And yes Delrae Mythique is amazing and if I was going for that subtle skin type scent –that’s the bottle I’m reaching for. The rep sounds like she was doing a fine job and it’s wonderful when someone happily gives you samples….although I’m squinting one eye….then the other….then both and wrinkling up my nose at the same time and I still don’t see a substantive difference between white musk and modern musk…. I admit I was stumped, too. Modern musk? Never heard of it, and I’ll be darned if I could tell the difference. I am so jealous of your nose Angela and Daisy! I can’t detect the flowers, it all smells like base-notes to me, let alone detect the difference in the “new” musk-which I believe is less animalic. Maybe it’s due to my still relative inexperience? By the way, I’m interested in L’Artisan’s ??? Blackberry musk? Mure A Musc…is that it? Can you really detect separately the earthy berries from the musk, or is it more a truer musk scent? I really couldn’t tell the difference between the musks in the regular Essence and the Intense. It’s been so long since I’ve smelled Mure et Musc that I don’t have much to say about it! You’re making me want to smell it again, though. I’ll have to see if I still have a sample around. Oh….Bruce Terrible huh? I love it! and you know how I’m thinking it…..”TehrREEEB-luh” too much fun. That was my first question to him! He said he says his name just like the English pronounciation–just plain “Terrible”. Which even makes it more brilliant. Good Lord, I hope he has Viking ancestry…it would be so fitting! What you said? Les Exclusifs are now at Nordstrom? Yes! At least there are testers at the downtown Portland Nordstrom. Hooray! This is wonderful news to me! I’ll take Bois des Iles! I think my Mythique is Jolie Madame, if that makes any sense at all (the new JM). Jolie Madame is pretty darned fantastic. I can definitely see it being a go-to scent. I don’t know why I don’t wear it more, but I’m getting out the bottle so I don’t forget about it. I get plastic pineapple out of Mythique. I love it, but that’s what it smells like to me. Pineapple chapstick and heady florals. It’s beautiful. And I get delicious sueded apricot! Closer to what I get! I never thought of the relationship between apricot and iris, but now I’ll be thinking of it. Which Nords were you at? I need to meet Mr. Terrible! I’m not surprised it’s so popular–it smells fresh and clean, and for so many people, that’s really what they want to smell like. Re: the Exclusifs – Elena over at Perfume Shrine reported in an October 1 post: Indeed Chanel sales representatives have been informed that the smaller 75ml bottles will be available in ALL Les Exclusifs Eau de Toilette scents in February 2011. Opera! speak to me! ….it’ll be alright, just breathe slowly…. Oh, yes – well, … Couldn’t resist giving your statement a touch of validation! It’s true, my credit card is shivering in dread of the February release. Haven’t tried BdI, but thanks to “La Grandissima” here, I now love both 31RC and CdR. my work here is done…. OH MY GOD! And I’m moving next month, I should really save some money!